What to expect in a nutshell? Yoga in a quiet bay in Kerala, South India. The shady roof-top yoga shala looks straight out at the ocean. Twice daily classes most days. Plenty of free time. Delicious food. Lots of fresh air. All levels, ages and backgrounds welcome. Unity. Transformation. Bliss and more from £750 pp for the two weeks. Curious about what past retreat participants had to say? Head here. Palm Tree Yoga Centre is magical with its ocean views and its roof-top yoga shala. It is placed just above the beach in a peaceful bay, yet is only a half hour stroll or a short rickshaw ride from the shops and restaurants of Kovalam. Accommodation is spread over three houses arranged in a triangle. For large groups we also use a fourth house closer to the beach. Massages and Ayurvedic treatments can be arranged on-site. 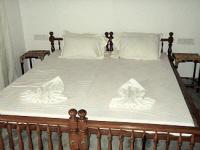 Where specific Ayurvedic equipment is required (such as for a herbal steam bath) the treatment will take place at the nearby Ayurvedic Centre. Food: There is an on-site restaurant. Each day after your morning yoga class a delicious breakfast will be served. Kovalam Village: Kovalam Village is two bays away and you can either stroll in along the road or take a tuk tuk. This is a great place to shop, visit restaurants, treatment centres and places to change money. Massages: Palm Tree has an on-site massage centre. Swimming: The beach is directly in front of the venue, sunbeds and umbrellas can be hired at a discount. The Indian Ocean can be quite vigorous and have a strong under-tow so there are well trained life guards on all beaches. The Leela beach is 5 minutes walk to the left of the venue and is protected by a reef so there the sea is normally calm and very suitable for swimming (you can also swim in hotel swimming pool at Sumadra Beach for a small daily fee – usually £2 to £3). Excursions can be arranged for you: just ask Halin our manager and he will arange transport and the excursions for you. Yoga will take place in the shaded rooftop yoga shala where we have space and equipment for 24 yoga students – however most groups are limited to 18 or less. There are cooling roof fans and bamboo blinds so that we may practice in comfort throughout the season. We will have magnificent views of the Indian Ocean as we practice. During the evening practice we will see the sunset over the ocean. There will be two yoga classes daily, one in the mornimg before breakfast and one in the late afternoon. We have allowed two days without yoga during the weekend in the middle of your holiday. This is so you may wander further afield to explore India, take longer excursions, or just relax. Yoga mats, bolsters, blocks and belts are provided. This venue is nicely decorated with cool marble floors throughout. All bedrooms have fitted wardrobes and en-suite facilities with solar heated shower, WC, basin and mirror, ceiling fans and mosquito nets on the windows. Housekeeping service cleans the house daily and changes bed linen and towels every 4 days throughout your stay. Each building has a communal kitchen with a fridge freezer. 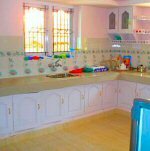 There is plenty of crockery, cutlery and cooking pots in case you wish to create snacks. Teas, coffee, drinking water and biscuits will always be available outside of meal times. 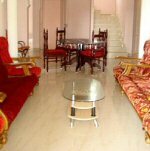 Each building also has a large and airy living room for relaxing with a dining area, sofa and comfy chairs. Travelling yogini. Free spirit. Avid sailor. Mother of three angels. Ayurvedic practitioner. Reiki Healer. Yin and vinyasa yoga teacher. Acro yoga lover. Experienced doula. Sustainability dudess. Lunatic dancer. Tarot card reader. Passionate writer… Dini is not one who lives life at halves. Her adventures have seen her live on a sailing boat cruising the Mediterranean with a baby and a toddler on board. Nowadays, closer to home, she is building an off-grid top sustainability home to use as a base between travels with her family in an eco-village an hour north of Sydney in Australia. She has been practising Yoga and meditation, on and off the mat, since starting university aged 19. Dance and fitness teachings turned towards yoga many, many years ago. Her continuous studies of Ayurveda, work as Reiki healer and Doula, passion for wholesome nutrition and holistic approach to motherhood and life all influence her teachings. Whilst many great teachers including Iyengar, Shiva Rae, Simon Borg-Oliver, Cam Storey, Clive Sheridan and Vipassana’s Goenka to name but a few have left traces and inspiration in Dini’s practice, her toughest teachers are her children. They play a transformational role in the journey of taking yoga beyond the mat and into a happier and healthier life. Old yoga scriptures are also a resource she often draws back upon. Dini works without a pre-set schedule, but takes what there is and builds on it. One of the beauties of a yoga retreat is that it allows for spending more time on poses and areas that need particular attention. Dini doesn’t shy back to gently push her students’ boundaries while holding a safe space to fall back upon. The only ‘cannot’ is in the mind and once that is dropped, possibilities are endless. breath and life. Her subtle, Reiki and Thai massage influenced adjustments have created a name for themselves and can aid major shifts in body, mind and Soul. Morning practices will be flowing through variations of and additions to Surya Namaskars with options to keep it basic, over medium to fully advanced yogis and teachers. Sessions and with pranayama to gain a deeper understanding of your own power to influence your breathe and through it the life force and energy in your body. Evening practices will consist of diverse meditation techniques and restorative Yin Yoga whereby seated poses are held for several minutes, letting go of any muscular tensions and alignment issues. This allows the body to release traumas in different koshas, or layers, possibly stored for years or even decades. As the yin areas of the body like connective tissue, ligaments and bones are accessed in the serene stillness of a yin practice, we open our whole selves up to boundless opportunities. Be prepared for more than a normal yoga holiday. Transformation and change are the only constants in life. Dini’s authenticity and aliveness, coupled with a great love and passion for passing on the teachings of yoga, has inspired many yogis and others around the world to also dare living the life that they dream of. Price starts at 750 GBP per person for the two weeks. For more information on cost, travel details, more pictures and to book, please head over to FreeSpiritYoga.